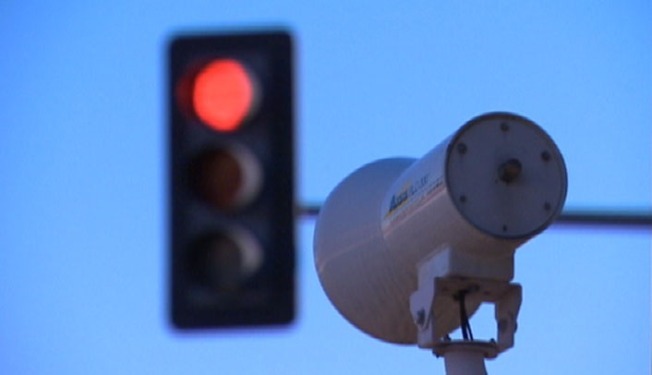 The City of Fairfax approved a plan to double the number of red-light camera locations at a city council meeting Tuesday night. According to the new plan, three new cameras will be placed at three intersections around the city. This expands the number of cameras from four to seven, and intersections with cameras from three to six. It's not yet known when the new cameras will be installed. The original proposal would have put cameras at two additional intersections with histories of accidents and rampant traffic violations. The council compromised with the three-intersection plan, eliminating potential cameras placed at the intersections of Main Street and Burke Station Road (eastbound) and Main Street and Woodland Drive (eastbound). Virginia enacted a 10-year pilot program for red-light cameras in 1995. According to City of Fairfax Police Chief Rick Rappaport’s presentation to the City Council, Fairfax was the first city in Virginia to implement photo red light enforcement. Eight intersections were enforced during the program’s initial run. The Virginia Assembly allowed the pilot program to expire in July 2005, but revived it in August 2011.